Spring Loaded On/Off Cord - 6ft. 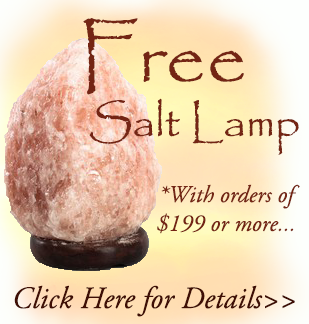 Looking for replacement Himalayan Salt Lamp cords? Our high quality, spring loaded, UL listed White Candelabra Lamp Cords fit all of our Salt Lamps. Add this delicous, flavorful spice to your foods and discover the difference Himalayan Salt makes! Considered by many to be the purest salt in the world, Himalayan Pink Sea Salt is unprocessed, so it remains free of bleaches, chemical additives, and preservatives, just like nature intended. Leave the chemicals behind and enjoy a natural alternative to commercially produced personal care products! 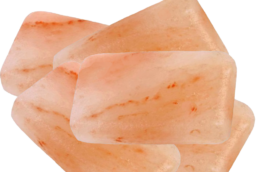 Europeans have been using a Himalayan Salt "Deodorant Bar" for years. Now it's your turn! The natural hydroscopic properties of the salt will keep you dry for hours, while the antibacterial, antifungal and antimicrobial properties of the salt kill the bacteria that cause odor! Our Himalayan Salt Crystal Deodorant Bars also work wonders when used to massage sore, tired muscles. Easily season beef, chicken, fish, even hamburgers and meatloaf for a sensational new twist on these old favorites with our Garlic Himalayan Pink Salt. Offered in a refillable Grinder Jar, our Garlic Himalayan Salt is also great for adding flavor to soups and stews, and seasons pasta, potatoes, rice, salads, and vegetables to perfection! Easily season meats, vegies, and pastas with the gourmet flavor of Onion Himalayan Pink Salt. Offered in a refillable glass Grinder Jar, our Onion Himalayan Salt is great for adding gourmet onion and pink salt flavor to foods like soups, stews, burgers, roasts, and more! This glass jar comes filled with 17.5 oz of Fine Grind Himalayan Pink Sea Salt. This delicious pink salt is 100% Pure, and Natural with no chemical preservatives or additives. Plus, it contains up to 84 trace minerals! This glass jar comes filled with 17.05 oz. of Coarse Himalayan Pink Sea Salt for an easy way to add this flavorful seasoning to any food. This 100% Pure, all Natural Pink Salt contains absolutely no chemical preservatives or additives, and contains up to 84 trace minerals! Our new refillable Himalayan Salt Grinder gives a full view of the Pink Salt at your table, allowing family and guests to sprinkle Pink Salt on any dish easily, while viewing the salt for a special gourmet touch. Rich in minerals, this delicious pink salt is completely free of all chemical preservatives and additives and contains up to 84 trace minerals! Himalayan Sea Salt is unprocessed, so it remains free of bleaches, chemical additives, and preservatives, just like nature intended. This 1lb Bag of Fine Grind Gourmet Himalayan Sea Salt is perfect for refilling your shaker jar. Himalayan Sea Salt is unprocessed, so it remains free of bleaches, chemical additives, and preservatives, just like nature intended. This 1lb Bag of Coarse Grind Gourmet Himalayan Sea Salt is perfect for refilling your grinder jar, or sea salt grinder. Black Truffle Sesame Seed Himalayan Salt Grinder - 8oz. Enjoy the sensational flavor of our Black Truffle, Sesame Seed Himalayan Salt Blend! No chemical taste like other sea salts; this is 100% pure powdered Black Truffle, artfully blended with Sesame Seeds & 100% pure, organic Himalayan Salt to give all your dishes a special touch of gourmet flavor! Our Stainless Steel salt rock shaver comes with 3 small chunks of pure Himalayan Salt, providing everything you need for a delightfully unique, gourmet presentation of the salt at your table! Your guests will delight in seasoning their food with this delicious, organic pink salt,shaving the chunks of Himalayan Salt with the salt grater! This gourmet seasoning is a potent blend of fresh, hand harvested lemons and himalayan salt that adds a refreshing citrus salt flavor to foods; perfect for seasoning fish, cocktails and ice cream. These cute 4-6lb Natural Himalayan Salt Crystal Lamps are ideal for personal spaces in your home such as the den or office, and also work great on the bedroom nightstand. *Free with your order of $199 or more! Use Himalayan Salt Kitchen Plates to serve hot meats & vegetables or cold dishes like Sushi, you can even add a gourmet, salty touch to deserts for a flavorful, healthy treat! This Himalayan Salt Plate is perfect for serving cold foods like salad, chilled fruits, vegetables, or sushi for two! No matter what food you present on the plate, get ready for a unique and delicious culinary experience! Our Medium natural salt crystal candle holder is made from a solid, 1-2lb Himalayan Salt crystal. 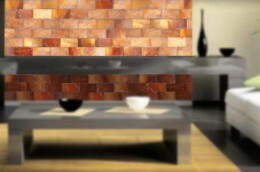 A lovely addition to any room, it imparts a sense of warmth and comfort with its earthy glow! These hand carved works of art are shaped like a whimsical globe, helping purify the air around them by releasing negative ions while emitting a warm, relaxing glow! 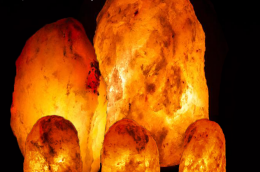 A few of our Feng Shui Salt Crystals added to the rocks of your steam room or Sauna release negative ions into the air as they evaporate, enhancing your relaxing experience! You can also display them in a decorative bowl in your home purely for their asthetic beauty; they make a wonderful conversational peice. Meanwhile, the crystals will result in tiny, micro-salt particles being released into the air for a touch of air cleansing affect where ever you plac them. 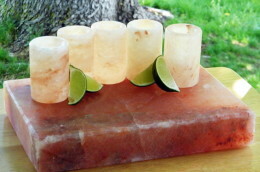 Our Large natural salt crystal candle holder is made from a solid, 2-3lb Himalayan Salt crystal. You can place these on any table to add a sense of warmth and comfort to any space! Candle lovers will love this heart shaped candle holder, hand carved entirely from high grade Himalayan Salt! These candle holders are the perfect gift for special occasions like birthdays, showers or Valentines Day. Set some around the tub to get the fireworks going. Our cylinder shaped salt candle holder creates a relaxing, beautiful glow & also makes a very unique, beautiful gift. Made with genuine Himalayan salt crystals and exotic Manuka Honey from New Zealand, both of which are well known for their rejuvenating benefits, this bath salt turns an ordinary bath into a sensational spa experience! 2.2 lbs of our finest, ready to use, Himalayan Fine Grain Sea Salt packaged in an old fashioned looking poly bag to maintain freshness, then enclosed in a decorative cotton pouch. 2.2 lbs of our finest Himalayan Coarse Grain Sea Salt packaged in an old fashioned looking poly bag to maintain freshness, then enclosed in a decorative cotton pouch.